Medu-Scientific is impressively demonstrating with the BMW i-experiment set, 3in1 ECO Energy Kit, how playfully sustainability can be conveyed. 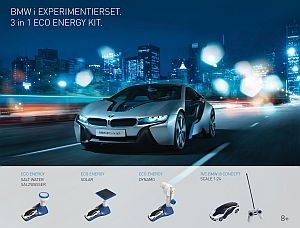 The set contains a BMW i8 electric test vehicle to the scale of 1:43 as well as a charging station with three different “energy supplies” – hydro power, solar energy and a dynamo – including instructions. The set that was produced in cooperation with EDU-Science H. K. Ltd. motivates people in a playful way to occupy themselves with renewable energy, which is why the car station won a Promotional Gift Award 2018 in the category Premium Products. The set also includes a remote-controlled battery- operated model to the scale of 1:24 for young and old BMW fans, which with its true to detail design is guaranteed to secure itself the pole position among aficionados of the BMW hybrid sports car. In the scope of the BMW license there is some design leeway concerning the customising options, a neutral-style own production and design of the set is also possible. Whether for the car industry, transport trade, motorsports, education or energy sectors – the 3in1 ECO Energy Kit is the right haptic companion for anyone, who wants to accelerate their marketing activities. Medu-Scientific Inh.